Tired of lugging around your old portable play yard? It’s heavy and clunky and really not that portable. Getting it packed up is a struggle, let alone finding space in the car. 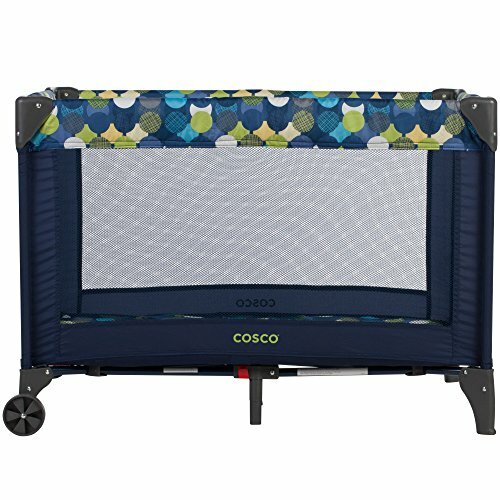 If you’re looking for a truly easy to pack play yard, say hello to the Cosco Funsport Play Yard. It’s everything parents need: a lightweight, functional, and truly portable play yard. It’s the perfect space for your baby to nap or play, both at home and on the go. The Play Yard is also easy to setup, taking less than 1 minute to pop it open so you’ll spend less time working to set it up and more time enjoying watching your little one play. Each Cosco Funsport Play Yard is fitted with wheels that make it easier to move around the house. It’s also easy to store and transport. With the included carry bag, it’s a breeze to pack up and toss this play yard into the car. FUNCTIONAL PORTABLE PLAY YARD FOR BUSY PARENTS - The COSCO Funsport Play Yard is lightweight and easy to move, so you can spend less time setting it up and more time enjoying playtime with your little one. SPEND LESS TIME SETTING UP - Setup is a breeze and takes less than one minute with this play yard. Just remove it from the carry bag, open the base, and prop up the sides. When you're done, fold it back down using the quick squeeze latch. MOVE AROUND THE HOUSE WITH EASE - Each COSCO Funsport Play Yard is fitted with wheels for mobility so that you can easily maneuver it around the house when you or your child wants a change of scenery. EASY TO TRANSPORT - The Play Yard comes with an included carry bag so that it's easy to fold up and pack into the car when you're heading out. PERFECT FOR ALL MOMS AND DADS - It's the perfect companion for Moms and Dads and gives little ones plenty of room to nap or play.